Scientists from the National Institute of Standards and Technology (NIST) have developed a test that could help to ensure quality control in roll-to-roll nanomanufacturing process. This advancement could allow manufacturers to test a variety of materials in real-world conditions in a fast and nondestructive manner. Measurements of electrical properties of a plastic tape (yellow), taken using a specially designed microwave cavity (the white cylinder at center) and accompanying electrical circuit, change quickly and consistently in response to changes in the tape's thickness. The setup is inspired by high-volume roll-to-roll manufacturing devices used to mass-produce nanomaterials. The changes in the tape's thickness spell "NIST" in Morse code. Roll-to-roll measurements are optical measurements that are made during roll-to-roll manufacturing – a technique that utilizes conveyor belts for constant processing of items, ranging from nanotechnology components to tires. Graphene and carbon nanotubes are innovative materials that could play a major role in many applications, including advanced composites and electronic devices. To ensure the use of such materials, manufacturers would need to perform quality-control tests to make sure that products have preferred properties, and do have any inherent defects. Present-day test processes involve scratching, cutting, and making contact with a product, which all tend to slow down the production process, and affect or damage the sample that is being analyzed. 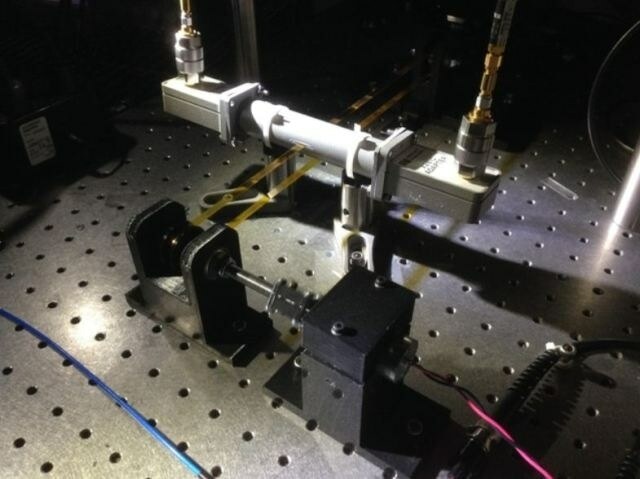 To improve the current non-contact testing techniques, a team of NIST physicists that included Christian Long, Nathan Orloff, and Jan Obrzut determined the film properties by subjecting these films to a microwave cavity, which is a uniquely designed metal box. Electromagnetic waves accumulated within the microwave cavity at a particular resonance frequency, which was eventually measured by the size and shape of the box. This can be compared to the way a guitar string vibrates at a certain pitch based on its tension and length. On placing an object within the microwave cavity, the resonance frequency alters in a way based on the size, dielectric constant, and electrical resistance. Dielectric constant refers to the ability an object to store energy in an electric field. According to Orloff, the change in frequency change is similar to how tightening or shortening a guitar string makes it resonate at a greater pitch. In order to determine these changes, the team developed an electrical circuit. The device was initially tested by running a plastic tape strip called polyimide via the cavity. This was done by utilizing a roll-to-roll setup similar to large-scale roll-to-roll manufacturing devices, employed to produce nanomaterials at massive scale. When the thickness of the tape was decreased and increased, which was done by making changes in tape thickness spell called “NIST” in Morse code, the resonant frequency of the cavity also changed simultaneously. The same behavior was seen in another parameter, known as the quality factor, which refers to the ratio of the energy maintained in the microwave cavity to the energy lost for each frequency cycle. Given that the electrical properties of polyimides are well known, manufacturers can utilize the cavity measurements to ensure whether a tape coming off the production line has a uniform thickness or not. Manufacturers can also regulate the thickness of the tape by feeding back the data obtained from the measurements. The new technique could also be used to track the electrical properties of a material that is not well-defined but have known dimensions. Long and Orloff demonstrated this approach by passing carbon nanotube films measuring 12 and 15 cm long. These films were deposited on plastic sheets via the cavity, and the electrical resistance of the films was subsequently determined. Orloff explained that the whole procedure was completed within a matter of seconds. With industry-standard devices, the measurements can be taken at speeds further than 10 m/s, which is more than sufficient for many current manufacturing operations. You can measure the entire thing, not just a small sample. This method could significantly boost prospects of not making a faulty batch in the first place,” Long noted. Since it is a nondestructive method, Orloff added, “If a batch passes the test, manufacturers can sell it. Graphene and carbon nanotube films are now being produced in large volumes for prospective applications, like smartphone screens, composite airplane materials, and wearable electronic devices. A patent application for this new method has been submitted by Orloff, Obrzut and Long in December 2015. Orloff informed that a manufacturer of such materials is already interested in this technique. “They’re really excited about it.” He informed that in addition to nanomanufacturing, the method could also aid in quality control of different kinds of products, such as pharmaceuticals, tires, and beer, if an appropriately designed cavity is used.